Defined as the West section of Greenwich Village, West Village holds mostly residential buildings which are perfect for New York Artists and lovers of art alike. 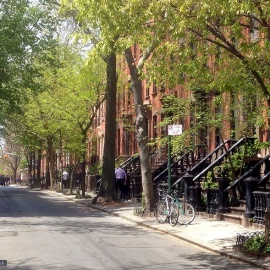 Although there are plenty of places to reside in West Village, this district also offers restaurants and shops so that residents can stay local if they do not feel like heading to Lower Manhattan or other popular districts full of entertainment. When visiting West Village, make sure you check out the Meatpacking District, the northern area of West Village, which boasts beautiful high-end boutiques and a thriving environment for young professionals. The cheesecake is AMAZING! Every last bite makes you want to take one home for later. Big enough to share, and great enough to not want to share! Pros: Lots of great choices.